The Ohio Stars were all wrong! I had put the wrong color in each corner! Yes, four of the nine patches were wrong in each block. I was 75 percent finished before I noticed. ...back to the drawing board. Yes, I ripped them all apart! I like the ones with the yellow stars better. Maybe once they all get spread out in the quilt it will all be okay. I'm still calling my quilt Summer Sunfish Pond. 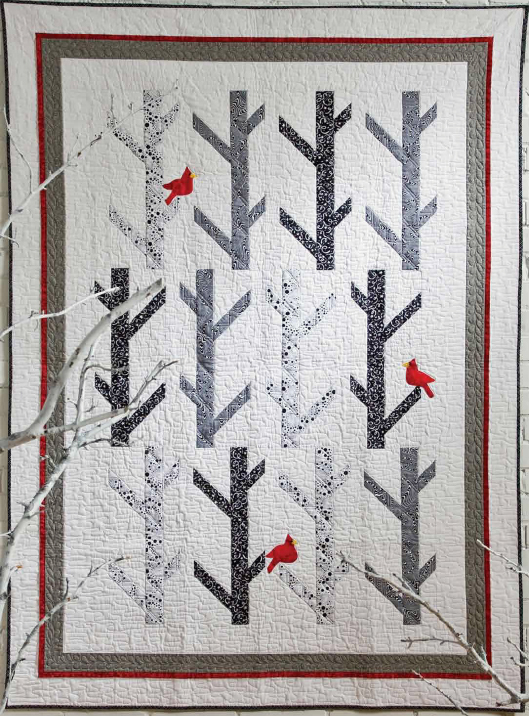 1) If you look at Barbara's list, she listed White Birches--pattern appeared in the October, 2010, issue of Quilter's World. Well, after seeing her post and how pretty the quilt was I just had to run to eBay and order that back issue of Quilter's World so that I could have the pattern too. I know I have fabrics like that in my stash. I feel the need to make a quilt for my sister. This could be the one for her. We'll see. Look at it! 2) I MUST save a spot open in November, 2012 for another Bonnie Hunter mystery quilt. Orca Bay is my first of Bonnie's Mystery quilts. I am very happy with it and wish to continue this each year. 3) By the end of May I need to finish a 30"x30" quilt for the June Quilt Show with our local quilt guild. I have my plan for this for the most part... sorry, Brandy, I'm not telling you what it is. Tee hee. 4) If I ever win a fat quarter bundle I would love to use Amanda Murphy's pattern Garden Jewels. 5) I'd love to make a triangles scrappy quilt like the one Judy from http://grammasquiltingroom.blogspot.com/2011/12/its-quilt-top.html made after she saw Julie's quilt. It would be a great scrap basket buster and I could use the dies I already have with the GO! Baby! This might be something that I work on as I visit my mom in the nursing home. My mom's nursing home experience doesn't seem to be pleasant. I'm not sure yet if I want to tie a quilt to the memory of it yet. 6) I love the raw edge circles on the quilt I saw at Marg's blog, Sunshine in Paradise. ( http://sunshineparadiseplease.blogspot.com/2011/12/ta-dah.html ) Marg's colors are JUST beautiful! You can see the great tutorial of it at Cluck Cluck Sew ( Raw Edge Circle tutorial by Allison). I could use my stash to make an adorable baby quilt for our annual charity quilt for the Local Quilt Guild. Hmmmmm. Are you seeing any pattern to my wish list? The problem is that several of them are quilts that I just saw today... (But I have also seen the patterns before and really liked them.) I'm sure there will be more that I just LOVE and have to have. This is my list to start. We'll see where 2012 takes me. My goal is TWELVE finished in '12. This is kinda funny. I got this message in my e-mail today while I was trying to join Fabricaholics Anonymous (Yahoo group). later to join us later. Happy holidays. I hope everybody had a great Christmas. 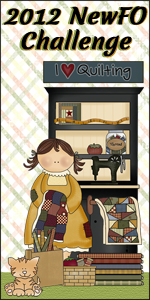 Here's my block for the We Can Do It Skill Builder Sampler. It's Block #20 - Circle Applique. I used the applique method where the circle is sewn to the interfacing, and then the interfacing is ironed to the foundation square before it is sewn. I used a page of the phone book behind each circle for extra support. I like it. It worked and kept my block nice and flat. 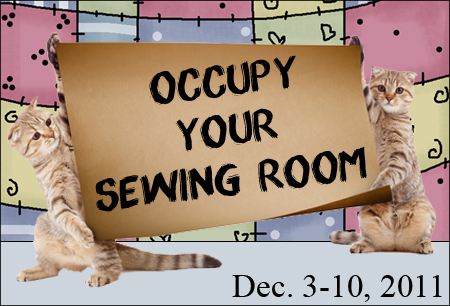 Check out the End of Year giveaway at A Desert Quilter!!! Nichol is giving away 20 Fat Quarters! I'm not sure what line this is from but it was so much fun! Very bright and cheery, just what is in order for these next few cold winter months ahead. Along with the fat quarters Nichol is also going to give the winner a $40 discount on the quilting..... You'll get 20 fat quarters and you'll get the quilt top quilted for the cost of stitching only! This is an incredible savings and Nichol can't wait to see what these beautiful fabrics become! No, there's no giveaway or anyting... just the awesome tutorials. Actually I put this in here so that I could find it! I'd spend it on a Kate Spain FQ bundle of Terrain! I finished Step 5 of Orca Bay. All of my little blocks are all in their baggies waiting for the next step. I learned from this Bonnie Hunter mystery quilt that it's important to stay neat and organized from step to step. I finished and mailed my December block for the Block Swap Adventure. I'll post pictures once I know my swap partner, Sara in Austin, Texas, received it. Now let's look at that "little" block in the first picture again. Here's another angle of it next to Abe. There are a like 1000 people doing this QA! The instructions are written in four languages. Jeanneke does her blocks by hand. Luckily Jantine e-mailed me the paper-pieced version. Whew. That saves a lot of headaches. LOL. The QA is to make one house a day for 364 houses for 2012 leap year. Are you in? Nichol is giving us a chance to win her OWL quilt!!! She's over at A Desert Quilter. Check it out! And just for fun here's my happy 4 1/2 year old... He's so happy and excited about Christmas! April at KoolBeenz is giving away a $25 credit for fabric or patterns at the Fat Quarter Shop! Check it out! Here's a sneak peak for Sara in Austin, Texas. Sara likes read, white, and blue. She also likes triangles and stars. Hope she likes it. Happy holidays, Sara. Sarah at Confessions of a Fabric Addict is having a giveaway. You could win a True Cut TrueSharp Electric Rotary Blade Sharpener! Not only did Sarah hit 500 followers, but adorable Lilli turned 4 years old! Check it out! Giveaway ends 12/22/11. Good luck! Michelle at MALT Designs is having a Giveaway: Race to the Finish Line to celebrate the end of the year. You could win a fat quarter bundle of Cabbage and Roses. Giveaway ends on 12/31/11. Check it out! I'll get all caught up with the stats next week... I'm not sure what happened to Lee at Freshly Pieced. She didn't do WIP Wednesday last week, and hasn't posted for days. She must be blog hopping! I didn't get much sewing done this week due to all of the blog hops. Boy, there are a lot out there and I'm not even half done. Happy hopping everybody! To win a charm pack of A Walk In the Woods, stop and celebrate Kat's blogiversary at: the blog Diary of a Flutter Kat. 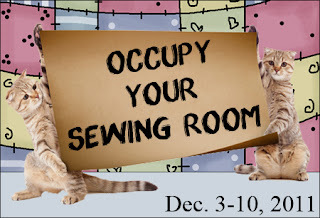 Check out Cat Patches at: http://catpatches.blogspot.com/p/occupy-your-sewing-room.html for more details on this challenge. I spent about four hours in my sewing space last night. My husband surprised me and came home early from working out of town. Yeah! so here's my progress on Step 4 of Orca Bay Mystery Quilt with Bonnie Hunter. I can't believe that I only got 18 blocks complete. Oh well... gotta keep sewing. Geez, I hope my husband doesn't miss the random pages of our current phone book that I ripped out so that I could have extra foundation paper. Tee hee. If you so desire you could jump on over to the Friday Night Sew in page and hop around and see what other have been up to. There right now 156 people who signed up to join. I spent over five hours in my sewing room today! Sweet! I had time to catch up my Chasing Chevrons quiltalong quilt top. I love this pattern that Jennifer from That girl... That quilt... created. Now I need to decide to border or not to border. I kinda like it like it is. It measures 74" x 74" right now! And here it is in the sun. Looks like a picnic blanket to me. There's still time to join this no-pressure QA! I'm happy to be caught up with Bonnie Hunters, Orca Bay, Step 3. I am thrilled that I completed Block #18 of th eWe Can Do It Skill Builder Sampler. I have been intimidated by this block for quite some time. But when I really concentrated on what I was doing, it turned out great! Here's all of the We Can Do It Skill Builder blocks so far... Half way there! There's still time for you to join. We're just getting to the more challenging stuff.